Ariana Grande headlined a star-studded bill at the Old Trafford cricket ground in memory of the victims of the bomb attack following her concert in the city last month (May17), with performers including Coldplay, Justin Bieber, Miley Cyrus and Katy Perry. While Usher's name appeared on the official line-up, the R&B star was nowhere to be seen at the gig, and music fans have now taken to social media to inquire about his absence. "I just remembered something, where was Usher?" one user wrote on Twitter, while another commented: "I know Liam Gallagher is a Manchester legend and all but WHERE IS USHER?" Earlier on Sunday, Usher shared links to websites where fans could tune into a live stream on the event on his Twitter page. He also posted an emotional video message about the event on Instagram, but made no mention of plans not to appear at the benefit concert. "My heart is with you Manchester, I'm so sorry for all your loss and all the pain you've been through," he stated in the clip, adding, "My family and I send our heartfelt condolences." 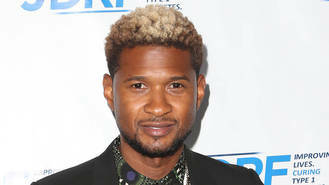 Usher's representatives have yet to respond to requests for comment. However, Usher wasn't the only artist not to turn up for the One Love Manchester. Many music fans had speculated that Oasis stars Liam and Noel Gallagher would reunite for a performance , but when Liam took to the stage he did so alone. Following the show, Liam sent of string of tweets thanking his fans for an "amazing night", and also criticised his brother for not attending. "I'd like to apologise for my brother's absence last night very disappointed," he stated. One Love Manchester raised more than $3 million (£2.35 million) for the Manchester Emergency Fund, as established by the British Red Cross.